It is only through the Holy Spirit that you can live the abundant life. If that statement is true then it is imperative that we understand who the Holy Spirit is and how he works. Here are a few scriptures that gives us a short overview of the Holy Spirit. The Holy Spirit is the third person of the Godhead: The Father, Son, and Holy Spirit. The Holy Spirit was there at creation. Isn’t it interesting to know that all three, the Father, Son and Holy Spirit took part in creation? Genesis 1:2 NASB The earth was formless and void, and darkness was over the surface of the deep, and the Spirit of God was moving over the surface of the waters. He was present in Old Testament times. Micah 3:8 NASB On the other hand I am filled with power– With the Spirit of the LORD– And with justice and courage To make known to Jacob his rebellious act, Even to Israel his sin. Psalms 51:11 NASB Do not cast me away from Your presence And do not take Your Holy Spirit from me. There are many others. And, of course, we see the Holy Spirit all through the New Testament. So, let’s focus on how the Holy Spirit can effect our Christian life today. Let’s bring it right down to where we live. Let’s discover how we can be victorious and have the abundant life Jesus would like us to have. Just before I was saved, and that was many years ago, I started having a curiosity about the Bible. I wondered what it said, and if it was important or not. I knew people who went to church and read the Bible, and I wondered what it did for them, if anything. I had a lot of problems in my life at the time especially horrible panic attacks that were ruining my life completely. There didn’t seem to be any hope for my future. I really didn’t know where to turn and I experimented with fortune tellers, astrology, and alcohol in an effort to find answers. Then I thought maybe I’d find some answers in the Bible. I didn’t know where to look though, so I just began reading at the beginning. That was hard because it wasn’t long and I was bogged down in genealogies which are very boring and difficult to read. So, I skipped them and pressed on. I read some in the New Testament too, but I had a hard time understanding much of it. “What? You need something called the Holy Spirit to understand the Bible? I don’t even know what that is, or where I’d get that.” I replied. It all sounded kind of spooky to me. Later, I discovered how to get the Holy Spirit. You see the moment I heard the gospel message and committed my life to Christ, the Holy Spirit came to indwell me and sealed my salvation. Not only is the third person of the godhead in me, but He also is my teacher. He also uses good Bible teachers to help us and I found Dr. J. Vernon McGee on the radio who also helped me tremendously. 1 John 2:27 NASB As for you, the anointing which you received from Him abides in you, and you have no need for anyone to teach you; but as His anointing teaches you about all things, and is true and is not a lie, and just as it has taught you, you abide in Him. Jesus was talking with His disciples and He told them that He had to go away but that the Father would send them another Helper, and that Helper was the Holy Spirit. He was sent to teach us. God knows us and He knew that we would need help in this world. While Jesus was here on Earth, He was only in one location at a time. But, He needed to go back to the Father and He promised to give us the Holy Spirit who can be in all of us at the same time no matter where on Earth we are located. That is simply amazing! Now, that we have the Holy Spirit does He make any difference in our lives? 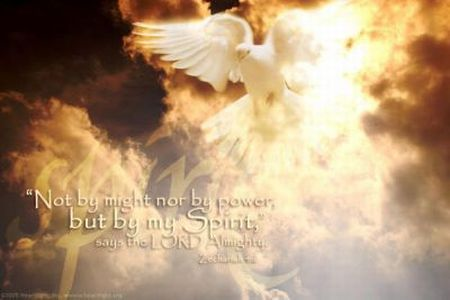 Do you realize that we have the “power of the Holy Spirit,” living in us. That power is the same power that raised Jesus from the dead. Wow! What power! If we have that much power why then are we so weak and unable to break out of our sinful habits? We have the power but it doesn’t seem to work for us. Romans 8:4 NASB so that the requirement of the Law might be fulfilled in us, who do not walk according to the flesh but according to the Spirit. Shortly after I was saved this dear Christian lady whom I later came to call my spiritual mother, sent me a little booklet called, “Walk in the Spirit.” I wish I still had that little gem. It was printed in England and was out of print at the time, but she felt I might benefit from it so gave me her last copy. But, to walk in the Spirit is like that. We go to God in prayer and ask Him to help us follow the leading of the Holy Spirit. Then, we start out our day. Yes, we slip too and fall down. We sin. When we do then we must go back to God, confess how we messed up, and try again. It is a learning process and with time will yield much success. I’m so glad I received that little booklet back then because it got me started out on the right foot, so to speak. What was the alternative? Well, the alternative is that we would walk in the flesh. You see, when we get saved we become a new creation on the inside. We get the Holy Spirit and all of His power in our lives, but there is a catch. Even though Christ died on the cross for our sins and we have been forgiven completely, and we are a new person inside, we still have to deal with the flesh. That is our humanness. Our outer man. Our inner man is new, but we still have the outer man. The outer man and the inner man are in a constant battle. It’s really a good thing we have the Holy Spirit because we could not win this battle without Him. Now, we have a choice. We can live our lives according to the flesh, or we can live our lives according to the Spirit. We can follow the desires of our flesh. When we do we will not be victorious over the sins in our lives. They will grow and get worse. When we live according to the Spirit we can have victory. That is the difference. When we try to beat some besetting sin and we continue to fail, we need to ask ourselves if we are operating in the flesh or the Spirit? That is the question. That just may be the key to your success as you battle sin. When we try to beat sin in the flesh it will never work. We might have a small victory here or there but we will never gain the total victory over it. But, if we totally yield ourselves to the Holy Spirit and allow Him to lead us in the battle, He will defeat the foe. We will be successful, and then we can give all the praise and glory to God. We will be able to live the abundant life He desires for us. on June 6, 2012 at 9:43 am | Reply A Guest that Isn’t Like a Fish « Jay A. Quine, J.D., Th.M., Ph.D.